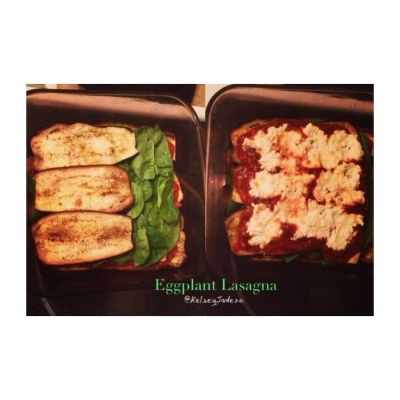 Low calorie lasagna! Meatless too! Great vegan dish and easy to make for lunches or dinner! Try it! Slice eggplant into semi-thin slices. Layer a baking dish by putting a few slices of eggplant firstly on the bottom; then sauce; then spinach; then tofu. Next layer is eggplant; sauce; ricotta; mozzarella. Place in oven and bake for 15-20 mins depending on oven temperature. Once cheese is slightly browned then broil on hi for a few seconds to make cheese bubbly. Take out of the oven then let cool for a few minutes then cut into 9 squares.